"It's been quite a journey to be in this zone. This is the deepest we've ever been," Alex Gardner, Trans-Cascadia Producer, kicked off the racer welcome on Wednesday night. 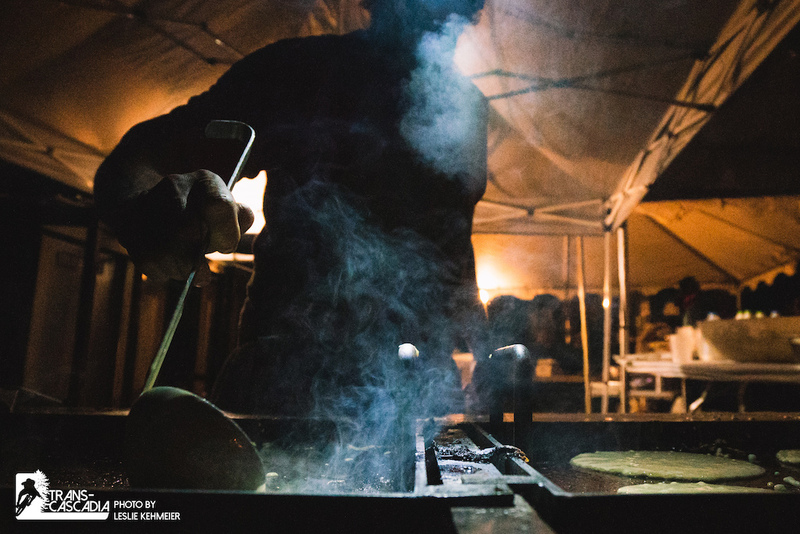 The crowd of returning and fresh faces were gathered together under a large tent around the tables where they had just finished a gourmet meal prepared by Executive Chef Chris DiMinno and provided by Chris King. 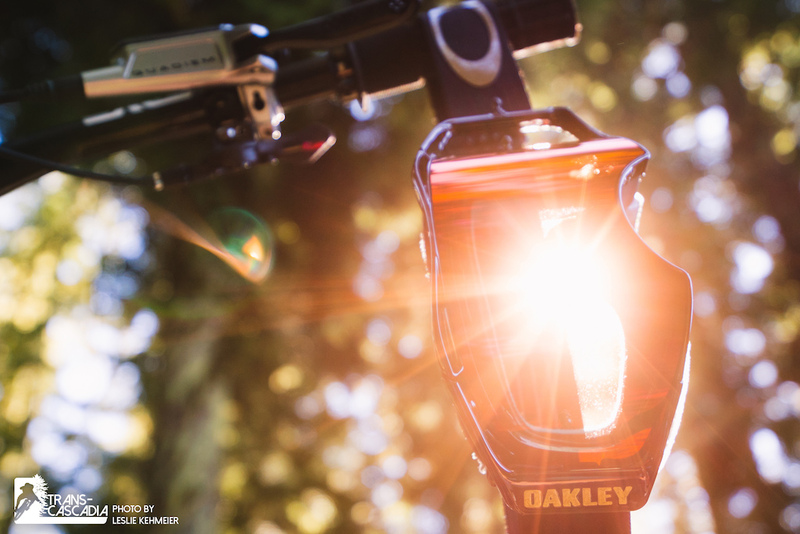 "We are so excited to share this product with you guys," continued Race Director, Nick Gibson. "We've been out here all summer grinding - how many of you came out and worked with us this year?" Half the crowd of nearly 200 racers and crew erupted with cheers and applause to signify their involvement. "A lot of people here were out digging and cutting and brushing trails. It was a huge project and we couldn't do it without the community. It's the community's race - and that's pretty sweet." This year's basecamp is in the heart of the Gifford Pinchot National Forest and the blast zone for the 1980 Mount St. Helens eruption. The long and winding - sometimes eroding - access road took racers through views of the volcano and the remnants of its destruction that is still evident today as they arrived. "There are so many layers to this forest," Nick Gibson explained to the crowd. "It's pretty unique. Gifford Pinchot is the father of the United States Forest Service. He and Teddy Roosevelt created the Forest Service in the early 1900's - and it was hotly contested. But, it paved the way for recreation and what we are able to do today - to come out here and ride trails. It's a pretty incredible thing and something that we've thought about a lot while working out here." 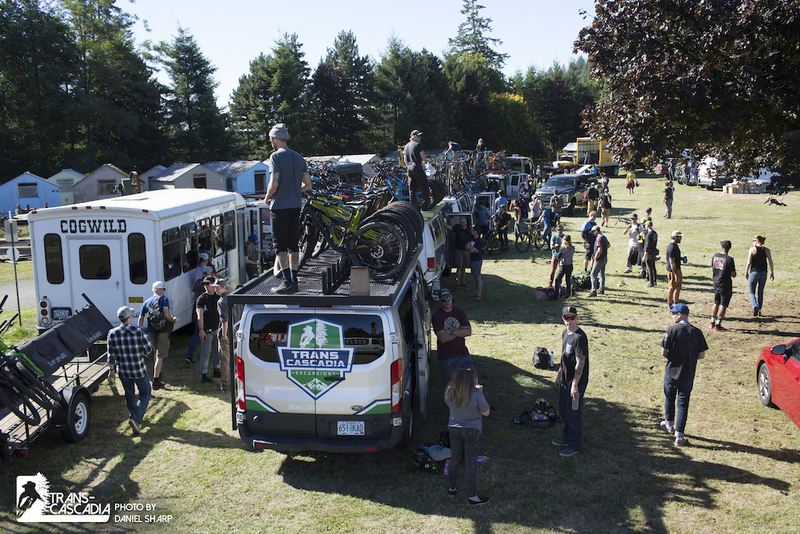 Despite being so remote, racers still have plenty of access to services with a WD-40 bike wash station, Shimano for tech support, Clif for nutritional support, and both Schwalbe and Oakley are onsite providing product to racers. 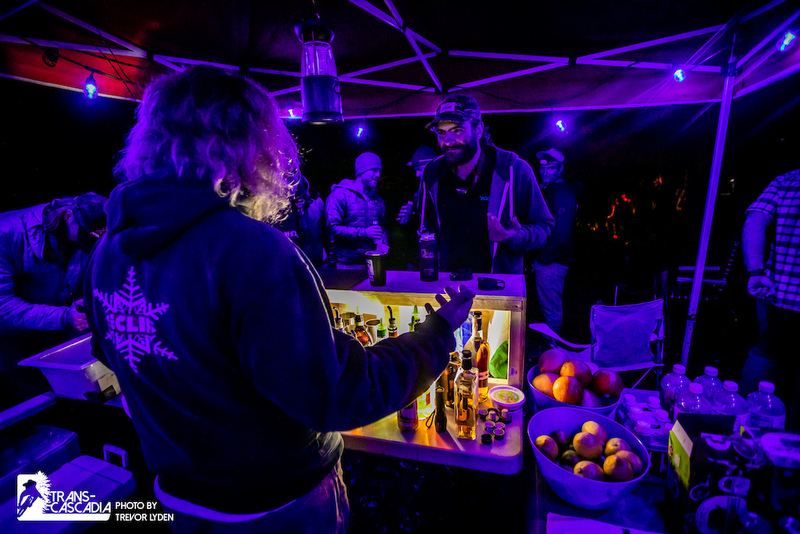 There are massage and physiotherapist available and a full bar with a bartender, free-flowing beer and cocktails. The key gathering area is around the fire pit and its end-of-days-huge woodpile. Even hot showers and what have been described as 'the nicest crappers ever to be used in the woods,' are here. "Anything you need we are going to take care of it," the Director of Logistic, Tommy Magrath, told the racers. "We are here for you. The only things racers need to pay attention to is when to eat, when to get on a shuttle [on days that have shuttles], and when to eat again. Coffee, breakfast, shuttle, dinner." Tommy wrapped up the Wednesday night meeting by summarizing the heart of Trans-Cascadia. 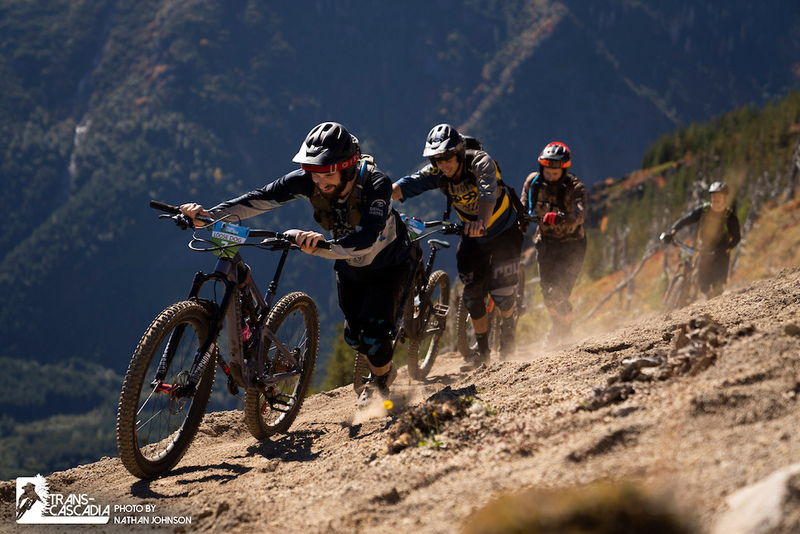 "We are out here to open backcountry trails and we use this race to celebrate the opening of those trails, so you guys coming out here; racing it and hanging with us, are allowing us to do this year after year. So, thanks to everyone - racers, crew, media, volunteers - thank you!" Despite the 5:30 am wake-up for most the next day, there were still plenty of people still around the bonfire at midnight. The bar was hopping, and a small dent was put in the massive wood pile while - without access to wifi - everyone got to know each other. Racers began heading out on course at 7 am. 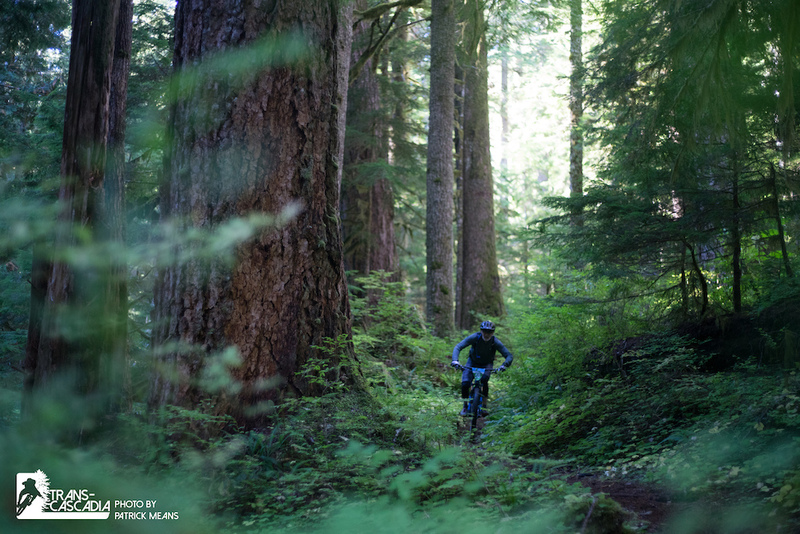 Following a flowy section of trail along the river, they pedaled through a stunning old growth forest before beginning a 30-mile climb with a 7,000-foot elevation gain. Roughly an hour-and-a-half up racers hit the peak and the start of Stage 1. "It's a big dump all the way down to the bottom with one neutral zone in it about a third from the top," described Nick at the racer meeting. A neutral zone is an untimed section; however, the etiquette is to keep moving within them. There were five creek crossings that were live during this stage; three were ridable, two were not. 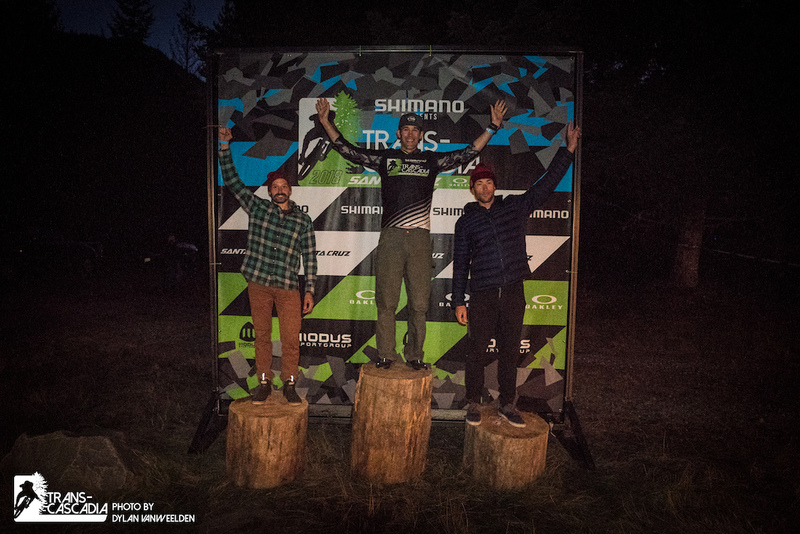 Aaron Bradford won the first edition of Trans-Cascadia and has become a staple of both the pro men's category and the basecamp culture here. Sitting fireside, he describes Stage 1, "after an hour or so of climbing we earned quite the delight. It was wide open and fast, and the dirt was just insane. Someone went through there with a rake, one of those metal super fine ones and it looked like one of those Japanese gardens with the perfect lines with the bends around the rocks and everything. It was absolutely glorious. And then it went into this lush lower half along the river that was really raw. Your sight zones went from 40 feet to maybe 8 to 10 feet. It wasn't much. That being said, the dirt was good - really awesome through there. It was a little fern valley." Once racers hit the bottom of Stage 1, they started another big climb and made their way around the east side of a ridge where there were two short stages. Stage 2 was a spicy, fun, and flowy mile with 700 feet of descending. Unfortunately, this stage saw Sam Schultz crash - and while he is okay - he is out of the race. Chris Johnston was at the bottom of the stage when they got the news about Sam. 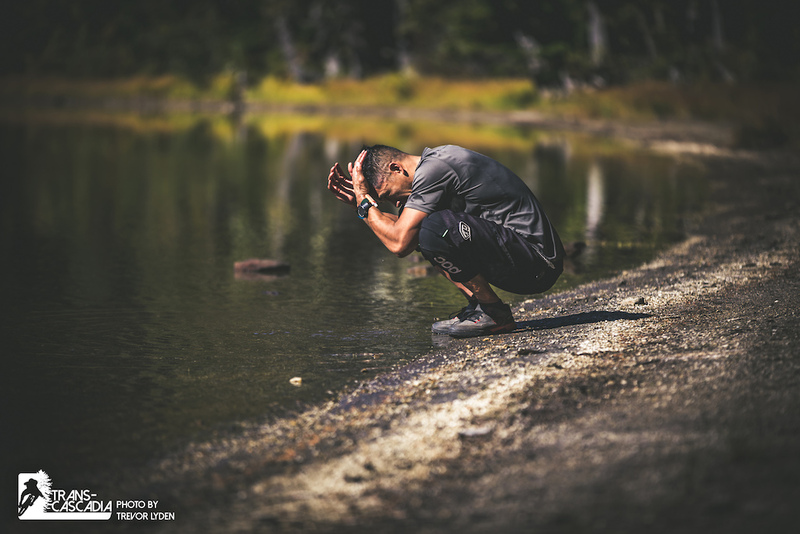 "We all held back and there were guys who went up to help - we just hung out until we had a firmer idea of what the first responders were going to do and if they would need more help before we carried on. I think it's an amazing community. After that, we bunched up and it was a good vibe and a good crew to ride with." 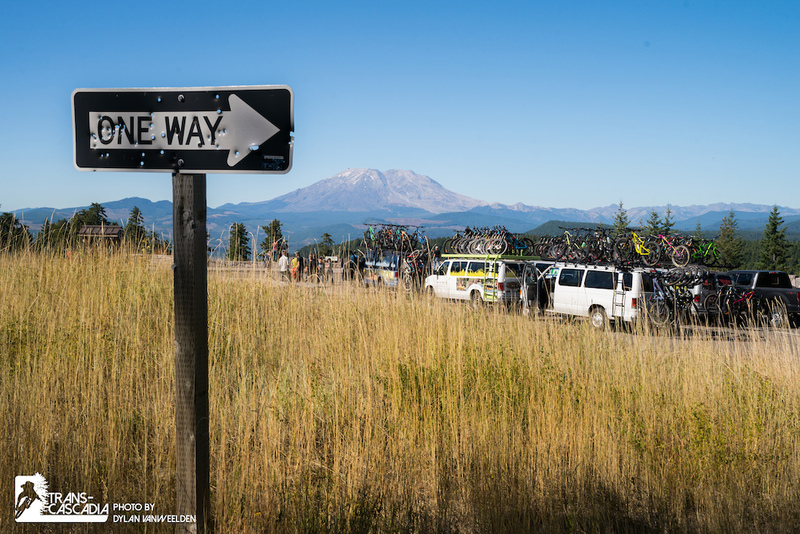 The start of Stage 4 was approximately a 30-minute climb back up to a saddle where racers took in views of Mount Rainier and the valley. 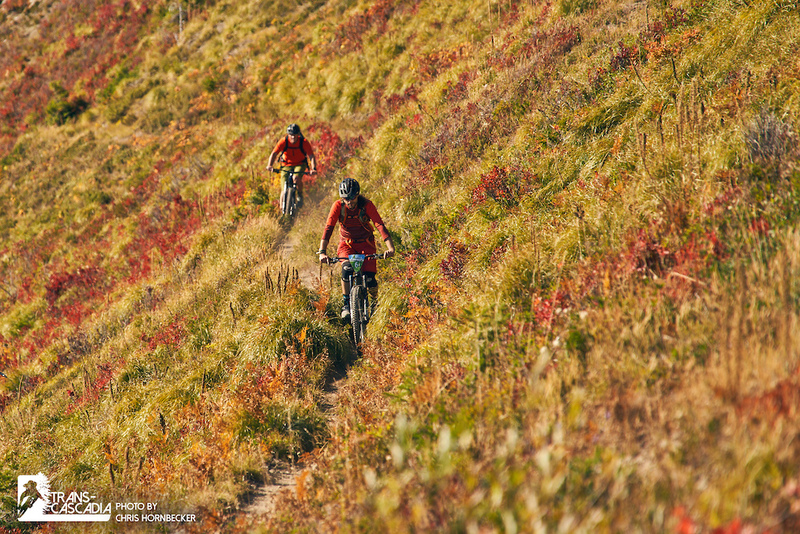 Following the ridgeline to the last descent, they dropped in and rode 2,000 feet back to basecamp. "[Stage 4 was] ridiculous," says Josh 'Ratboy' Bryceland. "I followed Loose Dog and I've never seen him ride so fast, it was quite the sight to watch, it was nuts!" This is Ratboy's first time at Trans-Cascadia and he says he had no idea what to expect. "I imagined it completely differently actually, but what a pleasant surprise. It was so dreamy. I brought a short travel bike, so I was worried that I would be under biked, but it was perfect - it was just dreamy conditions." Geoff Kabush would take the lead after Day 1 with Peter Ostroski and Francois Bailly-Maitre in second and third place. Geoff has competed in each edition of Trans-Cascadia and has won the overall pro men's category for the last two years. 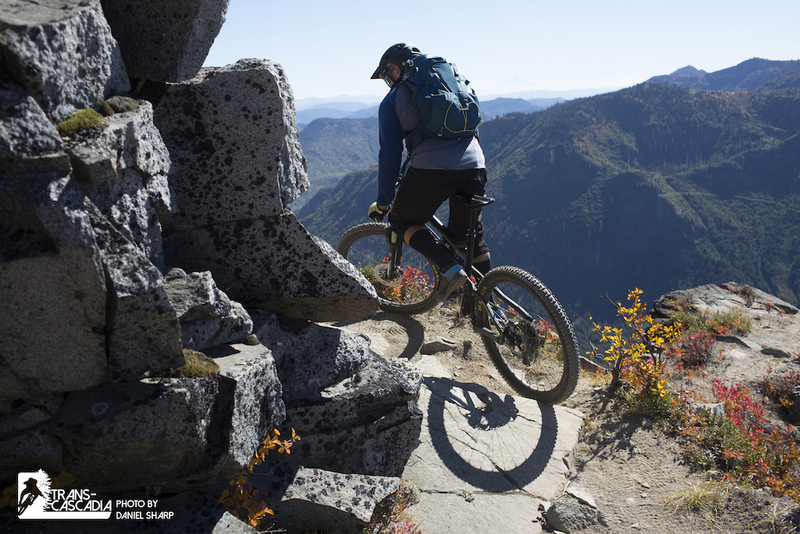 "The best part is exploring new trails. It was super fun riding around Oakridge the last few years because I've never really ridden in that area much before the race. 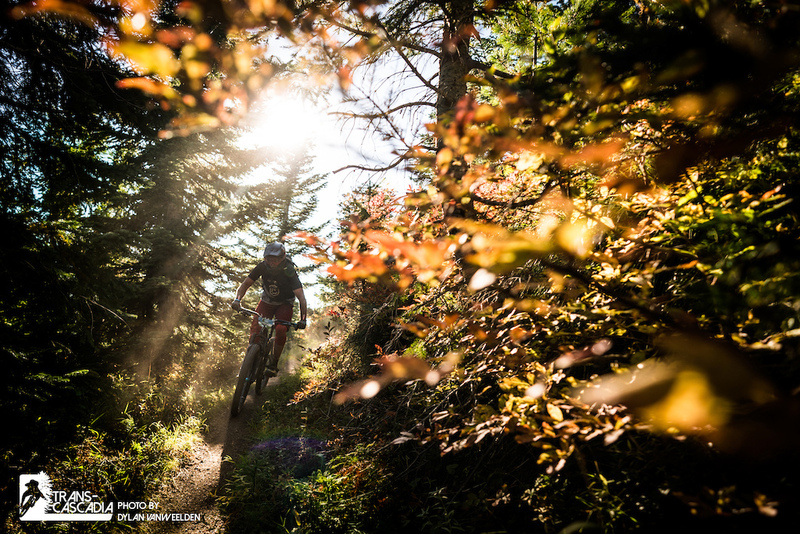 And I really enjoy riding the trails blind so it's cool to come here and explore everything that's 100% new." 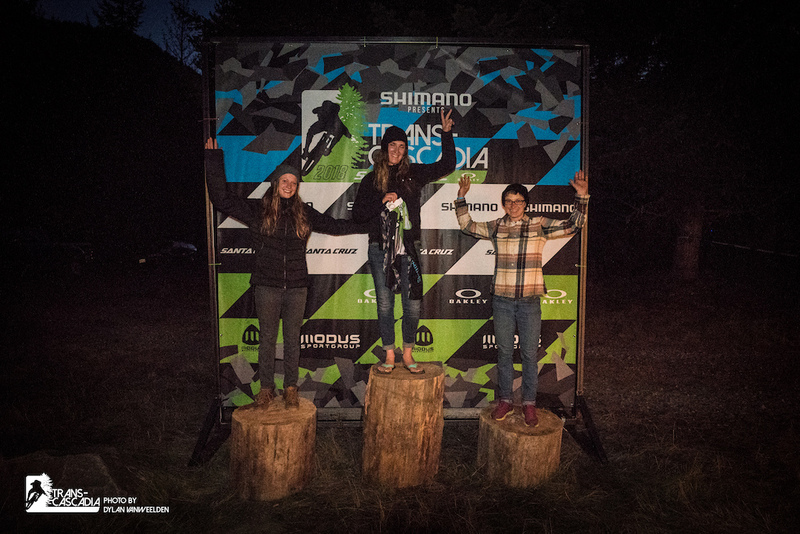 In the Women's category, Emily Slaco - who is experiencing Trans-Cascadia for the first time - took the top step, with Kim Hardin and Bekah Rottenberg in second and third place. "I don't think I had any expectations coming into the race," says Emily. "Stage 1 was good for shaking out the cobwebs and figuring out what the trails and dirt are like. It was super fun and it was nice to have the neutral in the middle as well. I've never had a race with a neutral section before - it was awesome! Stage 4 was so fast and straight down. We had a break at the top of the stage and the views on the ridge were stunning. Hanging out with everyone was fun - the crew made it fun, it was a good time." Overall, racers agreed the effort of the day was worth the rewards. "I had no clue what to expect," says Luca Shaw, "but it was awesome. Definitely the longest ride I've done just on trails. We were on trails for five hours plus - that was cool. Such amazing views and the tracks were so much fun. It's cool to ride this kind of terrain. It's pretty much untouched and a rare opportunity - just had an awesome day on the bike! I loved it." Chef Rick Gencarelli from Lardo in Portland was behind the action for the Day 1 dinner. "[We are serving] smoked duck burritos. We are doing grilled chicken thighs and we are doing grilled skirt steak as well. The idea is that we have all these different meats and we have rice, beans, and guacamole. It's nothing crazy but everything is fresh and delicious. I think it's a great post-ride meal." This followed a snack of fries covered with parmesan cheese, hot peppers, pork belly, and more. 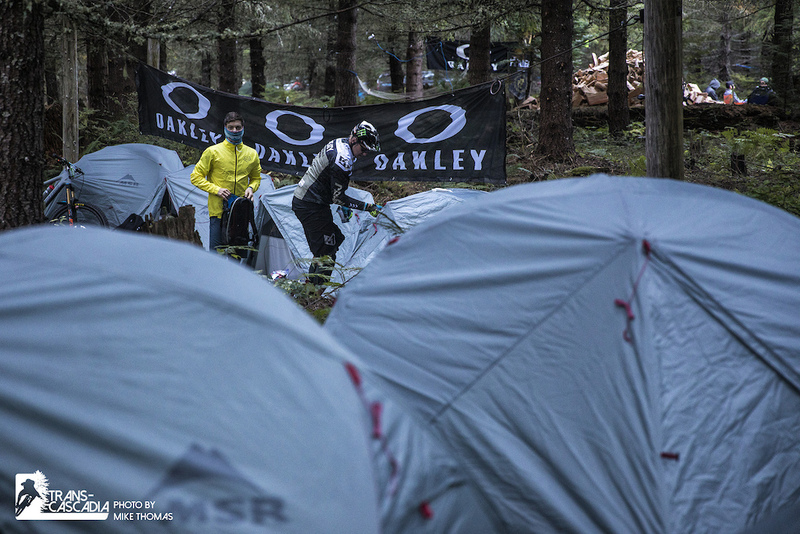 As racers finished up their burritos-of-epic-proportions they listened to what Day 2 has in store for them. There may have been a collective sigh of relief when the word 'shuttle' was mentioned. In any case, they were still all smiles from the day - even if they were exhausted, as they slowly drifted off to their tents, one-by-one, from around the campfire. Surely not? 30 miles and 7k footies in an hour and a half. Holy horse-power Batman! That has to be for the whole day and not stage 1 alone. Lol! Now that I think about it... averaging 20mph UP those slopes?! Amazing that they can get such a good edit out so fast. Props to the production team! This event sounds awesome and I love the coverage. But why don't we get anymore information about the name and/or location of the trails? I'm pretty sure this stage took place on Goat Mountain, but I had to squint hard at the map in the video to tell. I think it would help grow awareness if the trails were named. Because of the curated exclusivity? One can tell how deep they've gone by the price tag on the tongs at 0:49. 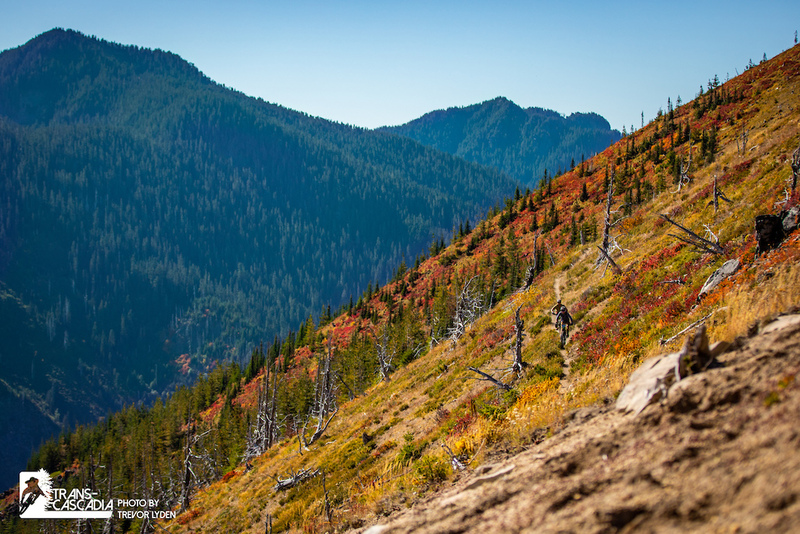 There are at least two Goat Mountains in Gifford Pinchot. Meet me under the woodpile, by Santa Cruz Transition. My guess is Green River trail cruise to start, up steep Vanson Peak trail, down Goat Creek trail for stage I, up Tumwater trail, stage 2, 3 on Tumwater ridge descents, stage 4 down steep Goat Mt trail back to Ryan Lake. Did I win? @jgusta: Winner Winnner duck burrito dinner. @jgusta: how about we don't share secrets with a bunch of jamoke pb readers? Hmm, Justin. Not a secret dude. Old school backcountry trail route of many years. Issue in past is that forest service wouldn’t always clear it every year. Trails that don’t see much traffic besides the event, is good to actually get tires on them somewhat regularly. Not a “stay off my wave thing”. But, yes trails don’t clear themselves and need help staying open. Blind Stages are done for the racers, so what’s the problem? Also, since these trails are out there a bit, lots of janky roads for poor access, not going to see a lot of users. Not your everyday Sandy Ridge or Post Canyon. 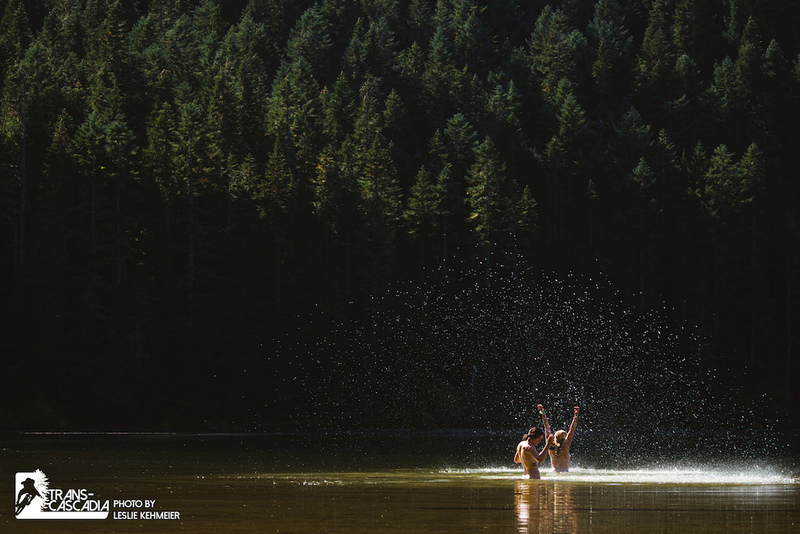 What is rad about the GPNF as a whole. Closest thing to wilderness riding with many options to explore if willing to take on the challenge. Not many people can bang out over 30 miles, and over 7k gain. Also, IMO, if trails are clearly mapped in trail maps of public forest service lands, than open to all. Trails I ride regularly on privately owned land is entirely different (non-mapped, limited building). 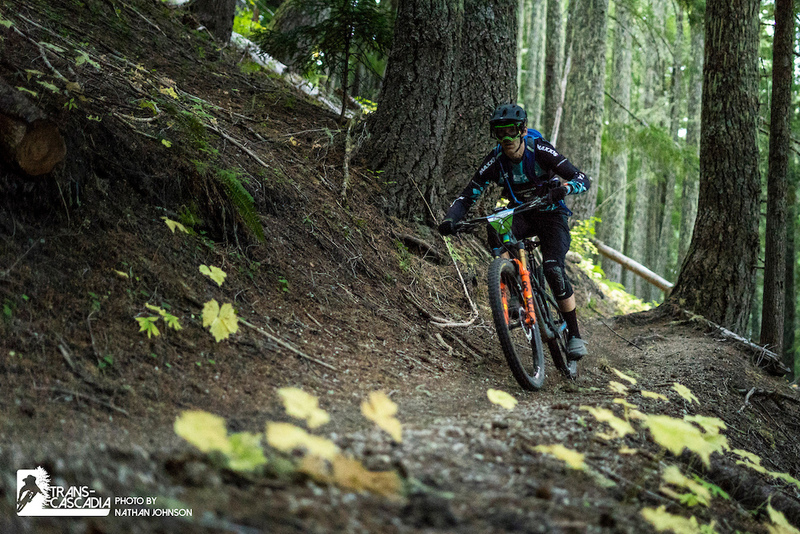 As long as motos and horses don’t trash the trails like many others in the GPNF since open to them as well, then more wheels aren’t going to likely negatively impact the trails. So forgive if moto-heads and trotters are reading this and decide to romp it ???? Oh man these are my backyard trails been riding them for years. Pretty wacky seeing a full out multi-stage enduro race. If I'd known I might have signed up for it but that's a decision from last Winter. I wish they would tell us what the actual routes are instead of vague descriptions. Obviously I have a pretty good idea what they are doing but still hard to be exact. Will there be a course map published ? Probably not, based on the last few years down here in Oregon. They never got explicit but with all the media and Strava it’s not exactly super secret either. It's better if locals don't enter these type of races . They hold back the race routes to avoid practice ?? You know it stops it being blind racing ???? I'll bet you could just ask the USFS what trails their permit covered. yeeeeah, Em! keep on crushin'! How about all those Santa Cruz DH boys up in the rankings. Luca, Loris, Josh, Peaty, and Minnaar. What?? No Lopes' sighting or podium brawls?? Emily Slaco is a pure shredder ! I hope she parties as hard as she rides!! Is there a running results page going? I only see 2017 results. I know this event isnt so much about the results, but would be cool to see them. Hipsters of the forest? Foresters? They're pushing because it was too steep to ride - regardless of bike or geometry. way to go em did u win the party ? Yeah boys! Sad i missed it this year. Have fun! What bike is Bryceland on? @nubbs: cheers. Wonder why he didn't run the Bronson for it. Where are all the pinkbikers who claim XC geometry is wrong on XC articles explaining why the enduro guys are pushing their superior geometry bikes up the climbs? Wasting energy on an 8 hour day for untimed sections would be pretty dumb. You probably wouldn't survive the event riding everything... at least you won't be competitive. @clink83: What's your point? They are timed for all of it, they don't have to be as fast downhill as these guys. And they don't have to do it for a week. Do you even know Geoff Kabush? 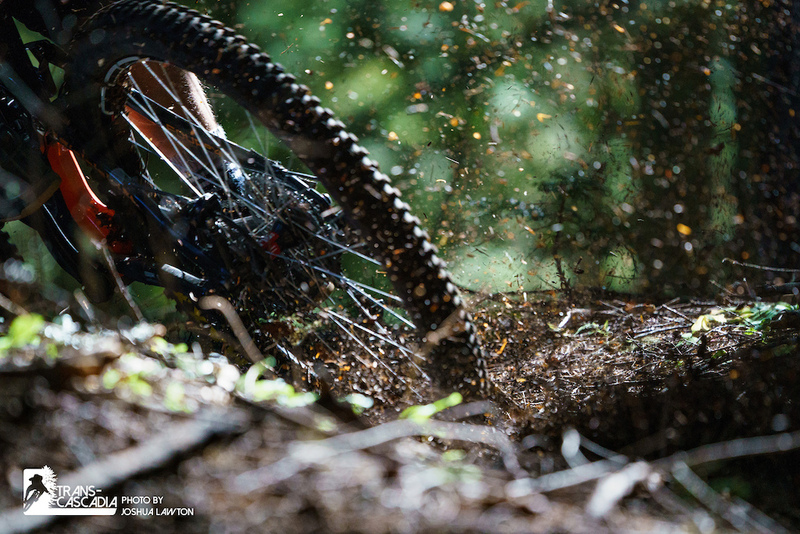 You know the olympian XC guy in the lead with an upforked trailbike instead of his XC bike? @jzPV: my point is that for all the nonsense that pinkbikers spew about XC bikes, here is visual evidence that enduro bikes don't have better geometry for climbing. Its about as stupid as saying XC bikes descend as well as enduro bikes, which your point about Geoff proves. @clink83: still, wrong assumption. they are pushing because they need to conserve energy and not because they aren't on their XC bikes or their geometry is inferior. 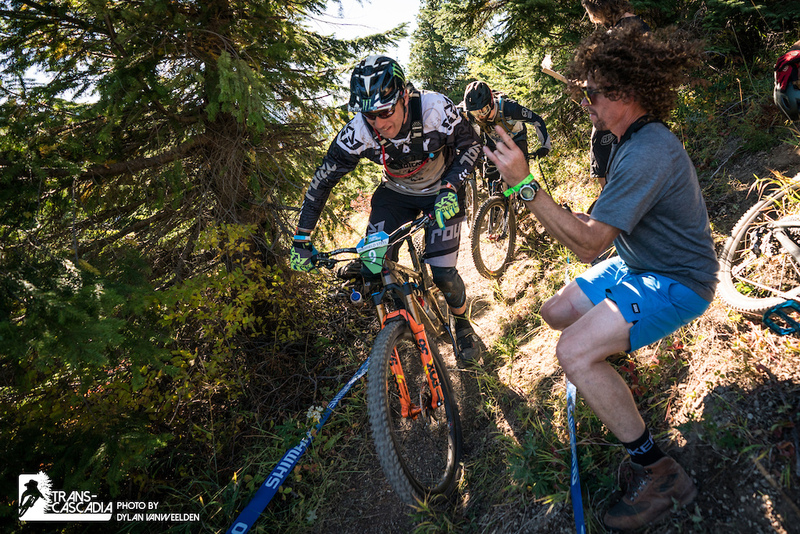 @jzPV: you could ride the course faster overall on an XC bike and not have to conserve energy ...but then you would be slower on the downhill and loose... 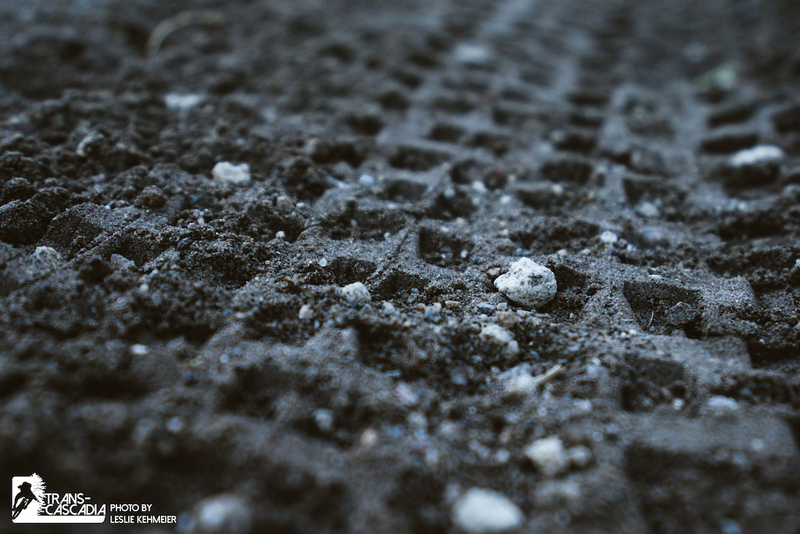 Different disciplines require different geometry. I understand that, Geoeff Kabush understands it, I don't know why pinkbikers don't. I spend a lot of time on XC bikes. After XC race season I hopped on my Enduro bike, which has a 76 seat angle. Got back on my XC bike the other day and was really missing the steep seat angle on climbs. @clink83: Different terrain than you'll see on a marathon XC course. Different disciplines for different reasons. On long rides, especially early in the day, I will push the bike up stuff I know I can climb. That way at the end of the day after 4k of climbing I am still having a bit of fun. My riding mates are for the most part better than me but towards the end of long days I feel like I am not as far behind as I am at the beginning of the day. IMO on an enduro style race setup you'd be a fool not to take most of the allotted time in between the timed sections. I believe Josh Lewis is also racing.